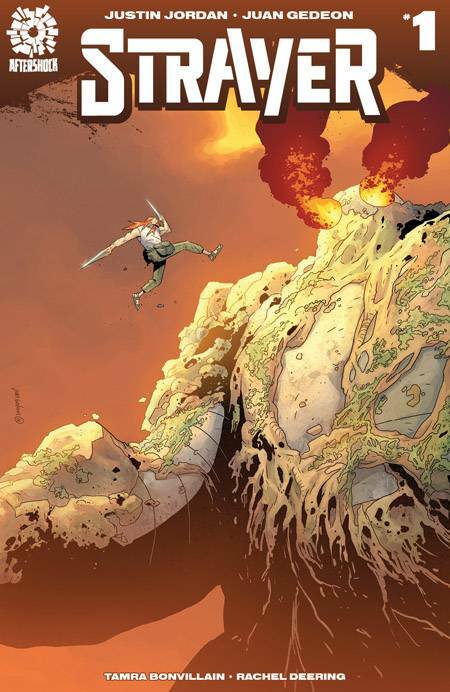 Welcome to the colorful world of 'Strayer' from Justin Jordan, Juan Gedeon, and Tamra Bonvillain. Its larger than life hero for hire is the titular character who comes to town to save everyone from a ginormous Titan, a technologically advanced destroyer of mankind. This is a quirky dystopian tale unlike many others where man is complicit in its downfall sending humanity back to the dark ages and one woman thinks she can return it to "the time of dreams." Jordan does a great job of setting up the mystery around Mala Tenboom who comes searching for help in the local pub. We meet her negotiating with a slimy mercenary when Strayer walks in. He's a giant of a man and not lacking for confidence. He's looking for the highest bidder of his services. There's a Titan headed their way and he's just the man for the job even if no one believes him. Mala may have found the help she needed. AfterShock Comics continues to unleash some top tier talent for the upstart publisher and Jordan (Spread, Luther Strode) definitely is a unique voice with an ear for dialogue and action. Even though the tempo takes a dip about midway, 'Strayer' is an open-world of possibilities that mixes dystopian and medieval adventure stories with a sense of light-hearted fun. Gedeon mostly shines with a nice cartoonish flair. There's big, bold, designs from Strayer to the Titan that give the layouts an epicness the story demands. The fight scene becomes muddled in spots but overall it's a winning spread. Tamra Bonvillain adds some vibrant orange and blue hues that give the issue a warm inviting feeling and matches the tone of the story. AfterShock has another winning title with a world of potential. Jordan, Gedeon, and Bonvillain have given birth to what could be the new pub's finest adventure series. Despite some rough spots, 'Strayer' sets the stage for the further exploits of a mysterious mage and her hero for hire in a world that could use some saving.